Every beekeeper knows how valuable smokers are. Without the smoker working around the bees would be quite difficult. The smoker creates an atmosphere of harmony between you and your hive enabling you to do all the work calmly and with fewer stings. Understanding the importance of the smoker and its proper use is especially important for beginner beekeepers. One of the most important questions you might have is, of course, why is the smoking of bees necessary? The simple answer is that it is safer for both the bees and the beekeeper. Allergic reactions from bee stings can be dangerous, so you should prevent them from happening as much as you can. Moreover, it encourages routine inspections and makes the work with bees an enjoyable experience. Calmer bees make a beekeeper more relaxed since there is no fear of being stung by the bees. Bees move slower so a beekeeper can work calmly and with more care. 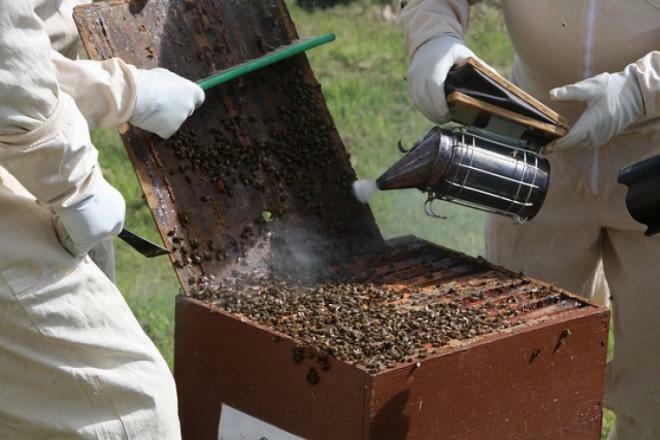 When both sides are calm and cooperative, fewer bees are squished during inspections. The relaxed approach to hive inspection enables the beekeeper to learn about the hive and study its activity. Why is smoking so effective? The bee smoker is effective due to bee’s natural instinct. When a bee detects smoke near the hive, it makes it think that the hive is in danger because of a nearby fire. As a reactionary instinct bees focus on caring for the queen and make preparations to move the hive. The preparation consists of consuming honey and nectar so they will have ample stores while looking for a new place for their hive. Since bees are focused on collecting honey and saving the hive, there is a lesser chance of a beekeeper being stung. Eating so much honey makes bees lethargic, so their activity decreases making them more manageable. Moreover, the smoke breaks up the pheromone signals that bees send to each other to warn of the danger. Opening the hive without smoke would disturb the worker bees, and they would use pheromones to signal other bees to attack. The smoke masks those pheromones and stops the communication preventing multiple stings, and bee loses (bee dies after it stings). 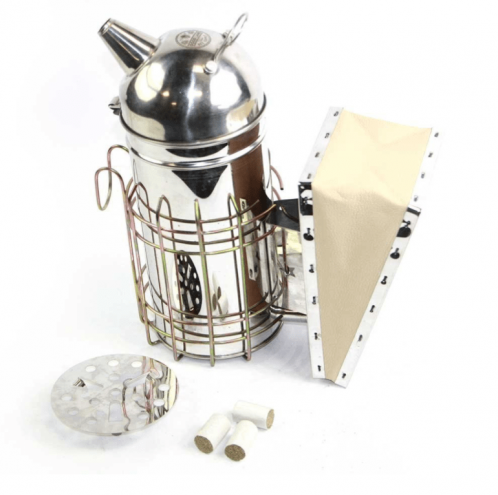 The smoker is an essential part of beekeeping equipment, and it should always be at hand. Using smoker makes the bees more cooperative so you should always use it when working with open hives. The easiest way to get a bee smoker is to order it from a service like Amazon. We found a quality smoker that already comes with smoker fuel logs (3x), so you can enjoy its benefits right away! This smoker is easy to operate for both beginners and professionals. Simply light one of the smoke logs and set it onto the burning plate. Close the smoker lid, slowly pump the bellows fanning the pellet and pumps smoke out of the spout. 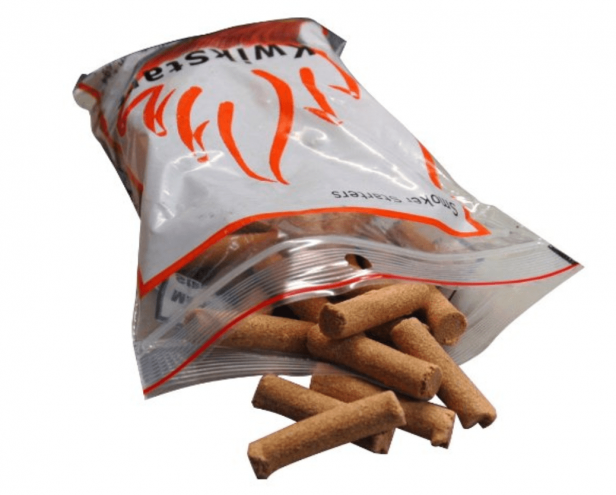 If you would like to be set for a while, you can also order a pack of fuel logs. The fuel we recommend lights up fast which comes in handy for hive inspections. If the log burns out, you can just add more and quickly after you can have the smoke rolling again.